Two thirds of global internet users are non-English speakers. Despite this, most scholarly literature on the internet and computer-mediated-communication (CMC) focuses exclusively on English. This is the first book devoted to analyzing internet related CMC in languages other than English. 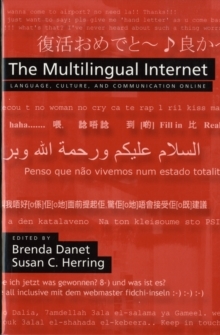 The volume collects 18 new articles on facets of language and internet use, all of which revolve around several central topics: writing systems, the structure and features of locallanguages and how they affect internet use, code switching between multiple languages, gender issues, public policy issues, and so on.